Last month, I submitted an issue with ErikZalm to get the compile errors fixed when compiling Marlin for Teensylu. The main branch of Marlin now compiles for Teensylu by setting MOTHERBOARD = 8. Unfortunately, this build setting won’t work with Printrboard, because some of the pins are different. Also, there is a kill function that Marlin calls if it detects certain things like a shorted thermistor, etc… but it’s not able to send the error messages back to the host, so it looks like your board is just dead. I think Erik is too busy right now getting V1 out the door to deal with making fixes for a couple of not so popular boards, so I’ve forked Marlin on github with my fixes for making it behave nicely with Teensylu and Printrboard. You can download it here: lincomatic/Marlin. For those who want to know what’s special about my branch of Marlin, it has to do with the mappings of the I/O pins. The code in Marlin has two different ways to access digital I/O pins: 1) the Arduino digitalRead/Write() functions 2) fastio – there are macros and pin assignments in fastio.h. In ErikZalm’s Marlin branch, the pin numbers are different between Arduino and fastio functions, which leads to confusion and bugs. What I have done is use the digital pin definitions in Teensyduino’s core_pins.h and updated the pins in fastio.h to match them. This way, a call to digitalRead(28) is equivalent to _READ(28). in pins.h, analog pins use ADC numbering instead of digital pin numbering. Therefore, even though B_THERM -> F0/ADC0 and E_THERM -> F1/ADC1, we are using them as ADC pins, so B_THERM=0 (ADC0) and E_THERM=1 (ADC1). There are 85 Comments to "Running Marlin Firmware on a Printrboard"
I have four Printrboards arriving this afternoon (1 for me, 3 shipping out). Could you send me a copy of your files? I updated my posting above.. There were several more issues to get it functioning properly. I’ve forked Erik’s repository until he gets Printrboard support into his main branch. Thanks! Your fork compiled, but it’s stuck in an infinite loop complaining about an invalid temperature. Must be a configuration error. I’ll be updating the Printrboard Wiki as soon as I have everything running smoothly. Still haven’t had success directly uploading firmware from Arduino, but a USBTiny + avrdude works perfectly. Kind of a pain to manually grab the .hex files. That’s what tripped me up at first. If you don’t have a valid thermistor hooked up, it assumes your printer is going to melt down, and kills itself. But the kill code locked up the serial output before you could read it, so it just looked like the board was dead. I have a blog entry telling how to upload directly to Printrboard from within Arduino with USBtinyISP http://blog.lincomatic.com/?p=502. I’ve also figured out how to do it with bootloaders, but haven’t had time to write it up yet. It’s like 10x faster uploading the firmware with a bootloader, because the USB serial is so fast. Came back to the desk with success, but you’d already replied. Thanks! Yeah, just had to plug in the rest of the printer. All seems functional now! I think you mean it fails to upload, not fails to compile, correct? Arduino versions < 1.0 have an old version of avrdude that fails with the avr109 protocol... some sort of DTR not set error. Just get a new version of avrdude and drop it into your Arduino folder. Also, to get into the bootloader, you need to reset it while the HWB jumper is out. Arduino 022 gives a compile error upon clicking “Verify” if your [BootloaderCDC]Teensylu//Printrboard is the selected board. Attempting to verify/compile Marlin produces the following error: ‘Serial’ was not declared in this scope. With Sprinter, the error changes to: ‘HIGH’ was not declared in this scope. Both firmwares compile fine with the “Teensy++ 2.0″ board selected. Seems like my copy of Arduino is missing something. That’s very strange. You’re using my boards.txt from http://blog.lincomatic.com/wp-content/uploads/2012/03/at90usb1286txt.zip and it’s in the hardware/teensy directory? * Launch Arduino and it should compile correctly with the Teensylu/Printrboard selected. If not then you can go into Arduino’s preferences and turn on verbose compilation which should give you some more hints about exactly what is going wrong. PxT, thanks for providing the step by step. The linked copy of Arduino 0022 that you provided above is actually what I provided to John! If you download the reprap version of Arduino 0022, you don’t need to do the steps in the blog as in step 1. That part is already done. The necessary files are in the AT90USBZ1286 directory and the Teensylu/Printrboard configuration is available. You don’t need to move any files either. Just unzip the Arduino 0022 from RepRap and start Arduino. Thank you for providing your valuable information here on your blog, you have helped me to get pretty far, however I’m in need of help. I’m using windows 7, arduino 0022 for uploading/compiling marlin (using directions on this blog entry), and have rebooted win7 and printrboard multiple times thinking the comm port was being a jerk in windows….but no luck….I’ve also tried realterm, and connecting to the printrboard, with the boot jumper installed, and it’s almost like the firmware isn’t running, it’s not taking input…..I don’t know what to do, any suggestions would be greatly appreciated and probably very helpful. 1) Although some other users have not reported the same behavior, on my Win7 x64 machine, if I have any program running which has the Printrboard’s serial port open, it will not properly detect the serial port. Make sure there are no programs running with the comm port open. 2) Make sure the jumper next to the MCU on the Printrboard is installed and shorting its 2 pins. 4) Use the Arduino UI Tools->Serial menu to make sure you’re trying to open the correct comm port. 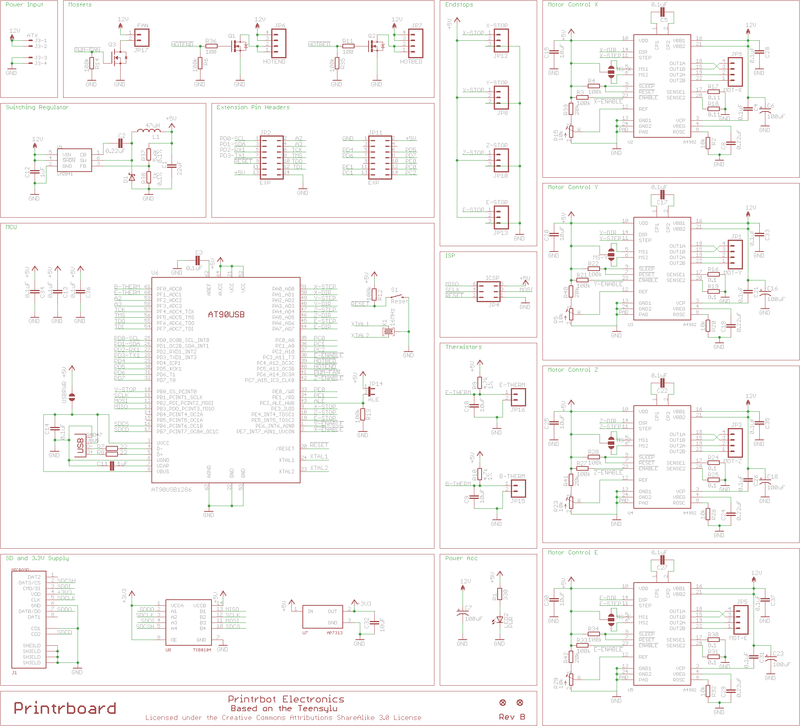 I’m investigating USB cable, power supply, and the schematic to printrboard. One thing I noticed, (observation, I’m NOT saying this IS the problem) when I have the USB pluged in and the external ATX power supply plugged into printrboard and NOT on the fan on the ATX supply spins, slow, but it’s powered. I then noticed on the printrboard schematic, and by probing with a scope there’s a switching regulator (U1) which is allowing bleed current from the USB to backfeed into the 12v rail, thus powering the fan on my atx (which the fan is directly internally soldered to the 12v rail on the ATX). This made me realise there’s no diode to protect that power bleed to happen and it occured to me this may be a problem in disguise; since two power supplies both source 5volts (one usb from computer, one atx supplied through (U1) on printrboard) are not using auctioneer diodes and could be potentially fighting each other (one sources the other does not, or they switch off when one can’t source enough) which MAY be why communications randomly drop out due to small power transients during print operations (I’m currently scoping this to investigate). The diodes will also take care of that bleed back “problem” on the 12v rail. Just thought I’d share in case someone else is having similar troubles or has a solution. I am not currently using endstops, but I haven’t heard of anyone else having your lockup issue. Are you sure you have the correct values for Y_ENDSTOPS_INVERTING, Y_HOME_DIR, etc? I have been using Pronterface with my Printrboard RevC for hours at a time, and the communications have been rock solid. Do you have a load on the 5V rail of your ATX supply? Many ATX supplies don’t provide stable output unless you have an appropriate load on the 5V (sorry, I don’t remember how much current you need to draw … I use an old hard drive). When the ATX supply is powered, the current should not flow back up the 12V rail, since it’s a higher voltage than the USB. Are you sure your 12V rail can source enough current to power your heaters + motors simultaneously? I got a dumb question… i hit the same problem and im struggling to understand why exactly it is (im in linux 64bit) that the teensy installer doesnt end with an arduino that contains that at90usb1286 directory. I’ve tried installing the teensy installer on both 0022 and 1.0 arduino ide’s and both end the same way, how did they get that dir on the arduino-0022 on the reprap-usa site? was there a component i missed in the steps somewhere? If you run teensyduino’s installer, you will end up with a subdirectory called teensy instead. I renamed the directory to at90usb1286. I gave them my setup to play with, not realizing that they would post it for download. What you said “i hit the same problem and im struggling to understand..” which problem are you referring to? BTW, you can’t just copy the teensy or at90usb1286 directory… you also need to run teensyduino’s installer … it modifies some of the java files in Arduino directly. Yeah, is there any way I could grab a copy of your Arduino directory? Email me and I can give you an FTP account. Really appreciate your help with this! @Matt Gingras: Lincomatic pointed me to your post. Our shop produced the only batch of Printrboard RevC’s in existence at this time. First, the 5V USB supply and 5V switching supply should have been isolated in this batch. There was an SMT solder jumper on RevB, but we bridged all jumpers on RevC because they couldn’t be machine manufactured (every RevB board required manual touch up work). The bridged 5V supplies shouldn’t affect reliability, and indeed have not had an impact, as far as I know. If you want to eliminate the possibility, you can slice the trace coming from the USB 5V pin. Onto your Y-endstop issue: I can’t reproduce that here. Our boards connect regardless of any endstop position, including Y. Our main Printrboard RevC prints for 8-10 hours a day and has never lost a connection or had a failed print due (besides mechanical/plastic flaws of course). Printrboard uptime is measured in days on that machine…it’s only disconnected when we have to reboot the PC. So, either you’ve found a faulty board, or there’s a wiring issue with your Y-enstop. I’ve seen this happen on Gen6 and Sanguinololu boards. Incorrect wiring can short the microcontroller to 5V or GND. When the endstop is tripped, the electronics lose power. Try swapping the Y-endstop with another axis. If the problem persists, contact your supplier for an exchange. Printrboard should be 100% reliable. I can confirm the Y-endstop issue. Connection to printrboard will hang unless the Y-endstop is engaged beforehand. I’ve gotten almost everything to run i’ve compiled the firmware loaded it onto a printrboard but when i go to connect with pronterface, the printer never comes online? I’ve tried several different Marlin configurations? Any ideas where i should look? After loading the firmware, did you put the boot jumper back in (shorting the 2 pins) and reset the board? If you don’t put the jumper back in, the board stays in bootloader mode. Try opening the serial port with Arduino’s serial monitor, and typing some gcode into it (e.g. G0 X0 Y0 Z0). Try stripping it down the the basics first.. run a simple serial echo sketch and see if that works. Got it. The endstops were causing the problem… I am using endstops hopefully some adjustments to the firmware will fix it. So enabling the x-endstop made the serial comms die? I don’t have endstops enabled in mine yet, but several people are having problems.. I’ll try to get to it later this week. // Disables axis when it’s not being used. The y and z endstops are working, though the x is not. When you say x is not, what are the symptoms? I adjusted the pins.h my limit switch was on the +ve side not negative side, after that everything worked. From windows it’ll work no problems, but just cant get linux to talk properly to it, is there something i’ve missed possibly? i just got delivery of a printrboard for testing and wondered where the pin definitions for the AT90usb1286 for arduino are? I looked in the obvious place core_pins.h in the at90usb1286/cores/at90usb1286 directory but that appears to be missing a definition for the X_MIN_PIN which is pin number 47 where are the defines in core_pins.h only go up to 45. Also confusingly the D and E port pin numbers appear different in the core_pins.h to the numbers that are used within marlins pins.h for example physical pin 60 which from the schematics here http://www.pjrc.com/teensy/schematic.html and here http://reprap.org/mediawiki/images/d/d5/Printrboard_RevB_Schematic150.png is port F1. F1 is assigned to number 39 within core_pins.h but number 1 within pins.h (number 1 within core_pins.h is assigned to D1). This mismatch only applies to ports D and F, all the other pin numbers match. the reason you can’t find pin 47 in the core_pins.h is because the Teensy doesn’t expose that pin, and the files are from the Teensyduino distro. The files in at90usb1286 are actually just renamed from the files you get when you install Teensyduino. I just renamed the teensy folder to at90usb1286. Originally, my plan was to make an Arduino distro that would support all of the I/O pins of the AT90USB1286, but then I found out that the Teensyduino installer is making some changes to the Java files, so you can’t just copy my at90usb1286 folder… you have to install Teensyduino, delete the teensy folder, and then replace it with my at90usb1286 folder… too messy, but that’s in the copy of Arduino-0022 that you got from John Seaber (I wasn’t expecting him to post it for download). OK, it took me a while to remember what’s going on with Pin 60. The B_THERM/E_THERM pins are being used as ANALOG pins… ADC0/ADC1, not as digital F0/F1. That’s why they’re assigned as 0 and 1. I’ve updated the article above with a detailed explanation of the mappings. I realise that for PE2 and PE3 this code wont work (I found the issue you raised about fastio/arduino incompatibility on the marlin issue tracker). All the other pins work fine with digitalwrite() other than PF4,PF5,PF6,PF7 (42,43,44,45) which are the JTAG interface pins. Changing the high fuse setting to “DB” (-U hfuse:w:0xdb:m) to disable the JTAG interface gave me access to these pins on the expansion header. I think it would be better to have the JTAG interface disabled by “default” as most people will probably want to use the expansion header pins as I/O. Thanks for testing. I’d like to add the missing pins to Teensyduino and make a distro that doesn’t rely on PJRC’s installer, but I need to figure out what it’s editing in the core Arduino java files. That would be the ideal scenario for Printrboard and other generic AT90USB128x projects. I agree with you that turning off JTAG is a good idea. More I/O’s are probably more useful for most people. Thanks for linking your blog. The Panelolo looks pretty cool. The only similar problem I have is if the port is open (e.g. in pronterface), and then I physically disconnect or reset the printer without first disconnecting it in software first, the computer won’t detect the port. I can confirm the Y Endstop issue, Does anyone have a fix or understand why that might be an issue? What kind of endstop are you using? Switch? normally open or closed? Same issue here. Using mechanical endstops that are normally closed. All 3 must be engaged (open) for the board to boot in Marlin. The board will boot into the boot loader no problem (with boot jumper pulled). Also, if the SD card is read while the endstop switches are closed, it will lock up the micro. I can read from the card while everything is homed, but it will die in the middle of the print when it goes to fill the gcode ring buffer. Same thing (the lock up) if I try to pull up the file list on the SD card if not everything is in the home position. My start up problem is gone and I can read the SD card now without having everything homed. Trying a print now to see if it works. The y-stop is on the same pad as the SD card reader. Maybe the SD card library doesn’t like sharing the same pad with the y-stop? When I first read this, I thought you were doing some kind of exotic debugging with the extra breakout pins. I didn’t register that the ‘e-stop header’ you mention is simply the extra plug right next to the z-stop plug. Since this is unused anyway, your ‘experiment’ is in fact a perfectly reasonable workaround. …just thought I’d clarify, in case anyone else missed this. I’ve just set mine up this way, and it’s working great. I did have to change the the nn_ENDSTOPS_INVERTING values false. I wired my endstop switches as instructed here: http://reprap.org/wiki/Printrboard. I came across the Y endstop issue too. At first I noticed the AVR chip was getting hot with the default firmware, turns out the Y endstop was not being configured properly. X/Z measured 30kohm to VCC, but Y measured 0ohm. I think we fixed it by uploading a different firmware. However I still get a connection problem. After resetting I have to unplug the Y endstop pin so it goes logic high (endstop pulls it low), or it will not boot at all. I even tried adding a resistor inline in case it was being overloaded, but nope, same problem. Looks like a firmware issue. I just double checked to make sure that Y_MIN_PIN = 20 is correct. From the schematic, it’s PB0, so it’s correct. Sorry, still too busy too debug this.. I will try to figure it out and fix the problem as soon as I can find the time. Something’s wrong with your Teensyduino setup. Try reinstalling it. Installing binutils-avr 2.22 fixed the problem. It’s not in Debian yet, but I found a deb that worked in Ubuntu’s Launchpad. Now I’m back to square one, unfortunately: I can compile Marlin OK if I select board “Teensy++ 2.0”. However, if I select “[usbtinyisp]Teensylu/Printrboard”, I’m back at the “Arduino.h: No such file or directory” problem. WTF? I must be doing something fundamentally wrong. I guessed my problem was that I was running Debian’s arduino 1.0.1 instead of 0022, so I installed 0022 and redid the whole teensyduino/at90usb1286txt.zip dance once again… I still can’t compile. Arduino 1.0.1, Board Teensy++ 2.0: compiles, doesn’t upload (no surprise, actually). I have been doing some Teensy projects before, and I can still compile those fine, both on 1.0.1 and 0022, but Marlin just won’t. The question is, of course, what is the Very Stupid Thing(TM) I’m overlooking? Segmentation fault in the compiler? Ouch. That’s not a configuration error, that’s the compiler itself. No, the version that throws that error is 0022. Ok. I just struggled with this and got it to compile and it SAYS that it uploaded… whether or not it did, I’ll see when I try to connect with RepetierHost. I’ve successfully installed your fork to my Printrboard, but I’m having occasional problems with a ‘skewed’ axis. Usually the layers are shifted along the Y axis to produce a slant, about 45 degrees; sometimes the X axis. I’ve verified that the GCode is okay. When it happens, the error is far too regular to be blamed on an intermittent hardware error… I suspect firmware; maybe a rounding error somewhere. I found a few vague references to the problem in relation to Marlin, so I’m trying to update your firmware to the latest Marlin code. I simply rebased your commits (except for the version merge) onto ErikZalm’s latest Marlin branch. It compiles & loads fine; my host software connects,but displays no Marlin sign on/version info; and then nothing. It seems that the host is stalled trying to deliver its initialization sequence. It’s not the thermistor thing you mention above. The sensor is connected and works fine with your fork. I’m an experienced programmer, but new to firmware. How do I diagnose this? Is it possible to somehow insert some logging code? …dare I hope for a debugger? Please point me to the right resource. Well, it has turned out to be a hardware issue after all… though I’m amazed that a slipping pulley could produce such a precise artifact. The G-Code must have had exactly the same number of abrupt moves per layer, and the pulley friction must have been very consistent… Anyway, the immediate problem is solved. But I’d still like to know how to troubleshoot that firmware! Thanks for getting the Marlin team to take notice. I submitted a pull request at the same time that I submitted one to the Sprinter team, and the Marlin team completely blew me off, while the Sprinter team immediately applied my changes. Personally, I would prefer to make a new AT90USBxxx version of Arduino, which seems easy at first, but the problem is that in order to get the correct parameters to AVRdude to work with a CDC bootloader, Teensyduino’s installer edits the Arduino Java files. Therefore, someone would have to write a new installer (or do a messy install procedure: 1) install Teensyduino 2) drop in the files for the new distro). The easiest approach would be to do what Sprinter does, which is use fastio exclusively, and not have to worry about digitalread/write, but it appears that they’re not willing to do that. I have rapidboard 3.0 implemented. unfortunately problem is regarding printrboard Rep. sometimes + Y axis works then -Y axis not works. +X axis works then -X notworks properly..
What to do in this situation plz tell me anyone….. I already have Marlin 1.0.0. But still I am getting such problem with some printrboard while other works precisely.. Wht to do ?? Here is another problem after successfully uploading bootloader using USBtinyISP loader computer cann’t detect Port on which printrboard is attached. Also Many times unplugging the printrboard. But getting failure every time.. This happens in many printrboard..
For this problem any solution??? I have 5 Printrboards, and none of them have any problems. I have some problem with Printrboard(rev D), that is, Printrboard with X-endstop can’t connect to Pronterface, but without X-endstop it can connect to Pronterface. Does not someone have an idea about what causes this problem? Does it connect OK when you turn of SDSUPPPORT? ‘With X-endstop Pronterface shows only “Connecting…”, but I think it might be connecting to 3D printer because of no error message in the pronterface.exe.log even after hitting ‘Reset’, so maybe the problem is that 3D printer doesn’t respond, I think. Of course I don’t know why. To tell the truth, I don’t know whether the messages show something wrong happens or not. I don’t use any SD card. Now I’m testing the movement of motors and so on, just after assembled my 3D printer. So I haven’t printed one piece yet. I would like you to tell me how you print without using endstops. Thank you. I just manually position the printer to the place where I want (0,0,0) using Pronterface, and then send G92 X0 Y0 Z0 to set the origin. Thank you for teaching me how to use the printer without endstops. Y and Z endstops work now, so I decided to print without X-endstop, instead of changing the firmware of Printrboard. I think pliability is best at any time. I’m planning to change the firmware of Printrboard from Marlin to Repetier. If I change it like above, can I resolve the problem of X-endstop? differences bet. sprinter and Marlin and which is the best ?? I can’t really say which one is better. I played with both, and decided to go with Marlin. Sprinter has much tighter, cleaner code, but I wanted some of the functionality in Marlin. Wow! A lot of good information here! I’ve read everything here three times and am nearly out of the woods. But I just can’t make sense of something. I have a PrintrBoard (Rev. D) and want to use the extra I/O pins on the expansion headers. I have the Marlin firmware compiled and running on the PrintrBoard. I have parts on order to implement the Automatic Bed Leveling. The problem is even with all the information here I can’t make sense out of the Pin definitions. I ended up adding an M command modeled after M42 to scan all the pins and pulse them so I can watch the results with a volt meter. The new M command prints out which Pin it is on, and if it is not a ‘Sensitive’ Pin, it uses pinMode() to set it to an output, then does a digitalWrite(Pin,LOW). Then after a delay(1000) it does a digitalWrite(Pin,HIGH) and does another delay(1000). Then, just to make sure I’m not driving something that should not be, pinMode() is called again to set that pin to be an input and the code moves on to the next pin. Here is the problem: The Expansion Port Pins that I have found do not make sense at all. So far I have not been able to find and use any of the Port-D pins. This may be because JTAG is enabled on my board. This issue aside, moving my probe from pin to pin and running the scan code, the schematic is claiming PE0 is Pin 8. PE1 is Pin 9. PC0 is Pin 10. PC1 is Pin 11. PC2 is Pin 12. Looking at Pins.h and Fastio.h does not confirm this information. In Fastio.h Pin 8 is PB0, Pin 9 is PB1, Pin 10 is PB2, Pin 11 is PB3 and Pin 12 is PB4. And it gets even more confusing! Looking at how things like X_STOP_PIN or Z_STEP_PIN are defined, everything seems correct. For example, the schematic shows X_STOP_PIN on PE3 and Fastio.h has that defined as Pin 35 which is what it is set to in Pins.h Similarly, for Z_STEP_PIN the schematic shows that connected to PA4 with Fastio.h claiming that is on Pin4 and Pins.h defining it to be 4. Are the Fastio.h definations wrong for the expansion headers??? What don’t I understand? And one more question, can I disable JTAG without an ISP by using the Arduino library : Fuse Support ? It pretty much looks like that will generate the required fuse settings but I don’t want to brick my PrintrBoard! Thanks so much for all the good information here!!!!!! Yes, the Marlin code is a mess. I tried to get the devs to integrate my fastio changes, but they ignored me. That was a while ago. Some other guys finally got native Printrboard support into the mainline code, but I haven’t looked at it, and don’t know if they accepted my changes or not. My changes were specifically to make fastio and and the Teensyduino Arduino functions use the same pin numbers, because they were using different numbers, which made it so that you had to use different pin numbers depending on whether you were using fastio or the Arduino functions. OK, I just looked at ErikZalm’s Marlin code on github. He still has X_STOP = 35, which in fastio.h maps to PE3 as it should. But the problem is, if you look in Teensyduino’s core_pins.h, pin 35 maps to PA7, and there’s no pin number assigned to PE3. So what does this mean? You’re OK if you use fastio on pin 35. But if you use digitalWrite(), pin 35 will talk to PA7. And digitalWrite() can’t even talk to PE3. My fastio.h at least maps pin 35 to PA7, so both digitalRead/Write() talk to the same pin 35. Can you send me a link to the schematic you’re looking at? Why are you trying to get pin numbers from the schematic? The schematic uses physical pin numbers, not logical pin numbers as used by the software functions. Tell me which pins you’re trying to access, and I’ll see if I can get you the pin numbers to use w/ fastio. I’m not familiar w/ the Fuse Support library. I recommend that you get an ISP if you want to mess around w/ fuses. And be careful. If you mess up the clock bits, you could brick the board. I did that to mine, but luckily, was able to use a signal generator on an external clock pin and fix the fuses. I am not trying to get Pin #’s from the schematic. (Actually, I did go down this path until I found your blog that explained the pin numbers are all virtual and arbitrary! THANKS SO MUCH!) What I’m doing with the schematic is seeing what Data I/O port and bit is on a given expansion port pin. And that seems totally messed up. It kind of looks like the integrated Arduino development environment can send updated fuses to the part? Or maybe I’m just hoping for the impossible!!! THANKS AGAIN for your help!!!!! I know it, confusing, but that’s what you get because Erik et al ignored my pleas to fix fastio.h. I’m not 100% sure, but it appears the fuse api is just to put some data into your ELF file, so that certain programming tools can fetch them to use w/ a programmer.